We will perform a complete safety inspection including the brakes, shocks, front-end and exhaust system with no obligation on your part. We will review our inspection with you to show you what needs to be done to put your car back into safe, peace-of-mind operation. We do not sell products or do repairs which are not needed. We provide you with a FREE WRITTEN ESTIMATE before any work is done. If you authorize us to work on your car and we find other work that should be done, we will call you for your approval first. We guarantee our work in writing, and our manager will review each guarantee with you. Although we recommend appointments, they are not necessary. We will do everything possible to establish and maintain reasonable pricing. We do not believe in “come-on” advertising, nor do we use misleading copy in our ads. All our advertising is carefully reviewed to make sure that it follows our company guidelines. Our personnel are professionally trained specialists. They know cars, and work on each one as if it were their own. 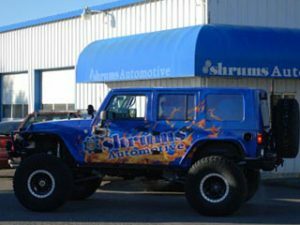 Between Shrums & Polar Bear Automotive Centers we have all your bases covered when it comes to automotive repair. With over 12 repair bays and 50 years experience you can trust us with your fleet! We know that time and efficiency is of the utmost importance when it comes to choosing a repair facility. We will work with you to find out what works fleet services best with your fleet of vehicles. Contact us to learn more about a customized fleet service plan for your business needs.